Silent Directed Retreats are ideal for anyone who could use a little quiet time away from over-stimulation to return to the center, to learn the art of deep listening, to recover a sense of wonder and gratitude for life, and to fall in love again with living. Offering: $495 includes $50 non-refundable deposit, spiritual direction, overnight accommodations, and meals. A Retreat to the Center – Journey to your center during this week of retreat. These simple, unstructured days offer the opportunity for morning and evening prayer and ritual, including Centering Prayer. Participants are invited to creat a retreat experience for themselves by making use of the art supplies in the Creativity Room; walking the grounds, lakeshore and labyrinth; participating in liturgies and service of the Racine Dominicans sisters; making time for personal reflection or prayer; journaling; scheduling a massage; or simply resting. This retreat is a time to tend your soul and listen to the voice inside. Sunday, June 9, 2019 at 5:00 p.m. to Saturday, June 15, 2019 at 1:00 p.m.
Fee: $425 includes $25.00 non-refundable deposit, spiritual direction, lodging, and all meals. Invite yourself into a week of sacred space, solitude, rest, peace and prayer. Tap the love of all creation amid the deep silence of 70 acres of prairie and woodland. Deepen your awareness of life’s gifts. Regain a sense of balance. Learn to be still to live in the moment and to deepen your relationship with God, with yourself, with others and with Earth. Each day affords opportunity for healthy meals, lots of quiet personal reflection and an hour-long session with a spiritual director, who will help you sense and cite the movement of the Spirit in your life. An optional centering prayer session closes each day. 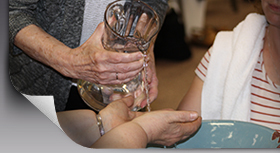 Holistic services, such as massage, healing touch and reflexology, are available for an additional cost. Silent Direct Retreats are ideal for anyone who desires quiet time away from over-stimulation to return to one’s center, to learn the art of deep listening, to recover a sense of wonder and gratitude for life, and to fall in love again with all of creation. This year’s retreat will explore “Mystic Companions on the Journey” through silence, meeting daily with a spiritual director, morning and evening gatherings for prayer and other options. Come and join us for a week of listening attentively to the music of life and to the still small voice within. Sunday, June 23, 2019 after 3:00 p.m. (includes evening meal) to Saturday, June 29, 2019. Offering: $475, fee covers room and board and spiritual direction. - Focus on personal prayer. - Participants will see a director once a day. - Evening prayer each day. This silent directed retreat provides an opportunity to meet daily with a spiritual guide, morning prayer with the Racine Dominican community, and evening prayer with the retreat group. Solitude, nature, and silence enhance these sacred days. Sunday, July 7, 2019 at 5:00 p.m. to Saturday, July 13, 2019 at 1:00 p.m. Many people today are conscious of living at a time of a great quantum shift, an evolving mysticism, interconnection—even “entanglement”—an emergence into wholeness. Grounded in the emerging cosmology that integrates science and spirituality, the Contemplative Retreat for Women is a week of inner exploration through one-on-one spiritual guidance, ritual and reflection, embodied prayer such as yoga and modified T’ai Chi, and time for silent reflection. Embrace and nurture life’s blessings, all of them, in a retreat tailored to your individual encounter with the Holy. This retreat includes a daily meeting with a director, time for solitude, and the opportunity to gather with others for prayer. This year’s theme, “Behold Your Life,” is inspired by the book by Macrina Wiederkehr and will be the focus of morning and evening prayers. While this is a silent retreat, there will be designated optional times for sharing with each other. Make this retreat what your soul is longing for. New meditators, have no fear—you will be led in how to meditate. Private directed retreats of any length are offered anytime during the year at the Franciscan Spirituality Center and at our hermitages, depending on the availability of rooms and your choice of director. We hope you will find an atmosphere of peace and quiet which allows you to listen more deeply and discover the movement of the Holy Spirit within your prayer practice. A directed retreat provides extended time for prayer, solitude and quiet. According to your preference, a daily one-on-one meeting with a spiritual director is provided. As a retreatant, you enjoy comfortable guest rooms or Hermitages and meals in quiet areas. Retreat length is flexible, and you may schedule directed retreats any time throughout the year according to your schedule and Prairiewoods availability. Six-day private, directed retreats cost $400, including lodging, meals and one daily session of spiritual direction. A $25 non-refundable deposit holds your registration. Privately directed retreats of any length are offered anytime during the year. The Francis Hermitage Room is available on a first-come, first-reserved basis. This quiet, corner room, located on the top floor of our center, features a queen size bed, an air conditioner, a refrigerator, cable TV, two seating areas, a desk and Wi-Fi access. It is located next to a bathroom and a kitchenette area with a microwave is available on this floor. Everyone needs time away . . . whether it's for one day or several days. Sinsinawa Mound Center invites you to come spend time at the Mound, "a place where the Spirit dwells." This is an extended time of quiet, prayer, and relfection. The retreat meets with a spiritual guide, according o individual arrangements, to pray and reflect on her/his own spiritual journey. Individually Directed Retreats available upon request at most any time. To arrange a directed retreat at Sisters of the Presentation please contact Sisters Julia, Jeanine or Annette.